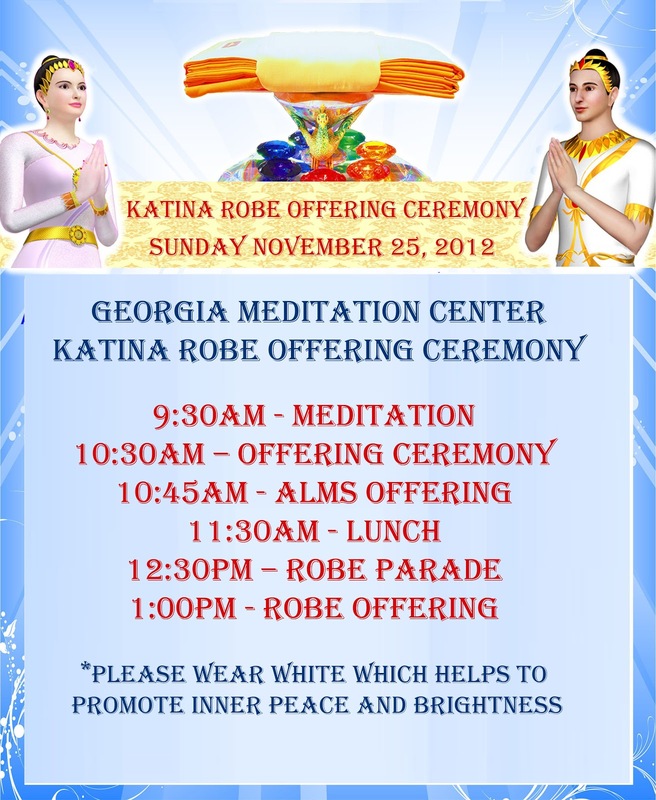 You are invited to a very special day for us at the Georgia Meditation Center! November 25th, 2012 marks the Katina Ceremony which is a robe offering ceremony presented to monks who have completed their 3 months rains retreat period. For 2600 years families have gathered to take part in the largest alms-giving ceremony of the Buddhist year, the Katina. Friends, old and new, parents and children join together in a celebration on the theme of harmony. Katina occurs at the end of Buddhist Lent. For an ordained monk, the period of Lent is a time for serious devotion to the ways of the Buddha, when he must strenuously observe his commitments to the 227 Buddhist precepts, meditate, and study dharma (teachings of the Buddha). We would like to invite our meditation members to come and witness this wonderful ceremony with us filled with an abundance of merit gaining experiences. The schedule of the ceremony is below feel free to come at any time that is convenient for you, but I would recommend to come before the alms offering portion of the day, which is where lay people offer food to the monks and there is always plenty of food prepared by many to offer to the Venerables, so please join us! For Buddhists and non-Buddhist alike, it is a great opportunity to observe the 2,600-year-old noble tradition of the saffron robe parade and presentation. If you would like to accumulate merit from the offering of the Katina robe to the Sangha with the lay community please send your donation of any amount by clicking on our paypal button at http://www.meditationcircle.org/HTML/gainmerit.html No amount is ever too small to make a difference, and it is the intention that counts more than the amount! Rejoice in your merits! The wonderful tradition of Katina-Robe Offering has been performed consistently since the time of the Buddha. The merit gained from Kathina is considered exceptional since it does not occur easily given that there are many requirements. For instance, there is a time limit – it has to be completed within a month after the end of Buddhist Lent. Thus, Kathina-Robe Offering cannot be performed whenever one wishes. This year’s Kathina is especially distinguished than any other year because it perfectly commemorates the 2600th anniversary of the Lord Buddha’s Enlightenment. If this opportunity is missed, one would have to wait another 100 years before the next centennial arises. Sunday marks a day where we dedicate our day to accumulating merit (positive energy accumulated from good deeds performed). Every Sunday a lay person takes on the role of Master of Ceremony, there are many different reasons one decides to take on the leadership role of offering food to the Sangha (order of monks) it can range from celebrations such as marriage, a birthday, a new home, to gaining merit for a deceased relative. There are many ways to gain merit that can be summed up into three basic practices; generosity, keeping the 5 precepts, and meditation. Every Sunday we have the opportunity to participate in all 3 practices. We must try to achieve these practices so that we can continue to cultivate good deeds and merit into our lives. Recently on November 11th we had a Meditation Member, Fausta Chavez, who also attends Alms Offering Service on Sundays take on the lead role as Master of Ceremony for her birthday. I look forward to more of our meditation members joining us to gain merit on Sunday’s and to take on the leadership role to present offerings to our Sangha!